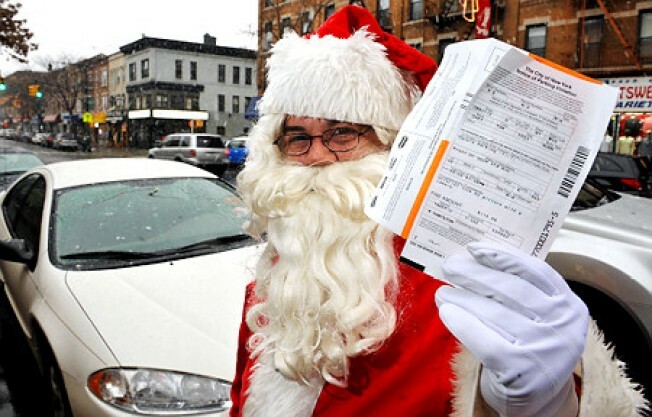 The DOF won't budge in its fining of Santa Claus -- they're enforcing his $115 parking fine. DOF, why all the Santa hate? Santa Claus, a.k.a. Chip Cafiero, shows off the parking ticket he got while he was delivering toys to kids in Bay Ridge last December. Hey, Department of Finance, did you get stiffed by St. Nick when you were nine? Listen, we know it can't be easy being you. People are parking illegally all over New York City, preventing street cleaning, blocking traffic and generally making a mess of things, and it's up to you to be the tough-love parent. So we know why you issued a ticket to an improperly-parked SUV last December. But then you learned - as we all did - that the car belonged to Santa Claus, a retired schoolteacher who was handing out presents to children in Bay Ridge that day, at a holiday event organized by Marty Markowitz. And did this sway you, DOF? Did this warm your cockles with holiday spirit? No. Apparently, you have no cockles to warm. Because on Friday, as Gothamist reports, you enforced your decision: St. Nick has to pay the $115 fine. So we have to ask: DOF, why do you hate Santa? What happened in your childhood - did the other kids ram their shiny new trains and remote-control cars down your throat while you got stuck with a pair of Garfield boxers that still had the $3.99 price tag on them? It might be time to deal with those feelings, DOF. Anger isn't healthy.